A poster that presents the technologies discussing the freedom and constraints of each. A critique of the poster and literature review. An exploration of the Podcast technology investigating its freedoms and constraints. Fig. 1 is a poster that showcases three different technologies that have been used for online instrumental tuition. The poster has been built as a website which can be seen by clicking on the picture below. The poster constructed here attempted to follow some of these guide lines. There was one picture that attracted the eye informing its audience that this poster was about playing the Scottish Smallpipes. There were a number of smaller links to click to listen to / watch the multimedia and the colour of the site was bright, but legible. Another major consideration for website design was the use of plugins. Flanders (2004) stated that plugins should be kept to a minimum, that people do not like to install extra programs unless absolutely necessary. He also goes on to say that unless it is specifically a music website, sound files should not be used. As this poster is discussing online methods of teaching music it conforms to Flanders suggestion that audio files were acceptable. By designing the poster to be viewed as a webpage this ensured that it would work on all fairly up to date platforms (Apple Mac or PC) but software was required to view the movies. Software is an issue with all IT related activities. As it is an internet based poster a link is provided to download any required software. This should suffice but it is possible that older machines may not be able to cope with viewing the movies. Another bad design fault according to Flanders (2004) is the use of Cascading Style Sheets. This website uses cascading style sheets, which can cause problems in browsers that dont support them, including a refreshing issue that prevents the style sheet from showing in Firefox. (The browser that was used in designing the site) It would be best to redesign the page so that the style sheet is not used, but due to time constraints this is not possible. The web page was chosen to represent the styles of online teaching being discussed. Split into three sections each section was represented using as close to the original technology as possible. The website section used a mix of audio and movie, the webcasting used movies and the podcasting only audio. This was to aid the audience feel a sense of what was being discussed. As much care as possible was taken over the contents of the video and audio to ensure the integrity of the reflection on the research and technologies. It is possible however that this was not sufficient and that scripting should have taken place. However by scripting the audio it would have lost the informal feel and moved away from the podcast style. Most people are used to reading, be it in detail or just skimming over the presented facts. By using multimedia it prevents skim reading and the participant must listen to the entire presentation to glean all the information given. For this reason each piece of media was kept short and clearly labelled short manageable chunks used. Using audio and video opened up the poster for people with low literacy, but not with low bandwidth as multimedia files were too large to be downloaded on 56k. The language of the poster was consistent with the language of the three technologies, which was in term chosen to reflect the vernacular language of podcasting. There has been little written on the pedagogy of learning processes in traditional music and as such this is an area that needs further study. Elsewhere in the music environment, research is being undertaken to investigate online music teaching. The Santa Barbara Music Academy has undertaken research into performing synchronously online, putting on concert where two musicians perform a duet from different locations across the internet. Ruippo (2003) looked at synchronous communication, phone / video conferencing. His work focused on technological resources replicating the real teaching scenario by trying to mirror the face to face experience. Video conferencing was explored and developed as the preferred model of distance learning. The freedom to teach music on the internet has only become possible as the internet has become faster and more versatile. The evolution of computer based technology has been very swift and is still developing. This speed of development is none more apparent than when looking at literature where an issue of importance in one moment appears to become a thing of the past in the next. Ten years ago Mason (1994) talked of audio graphic systems requiring two phone lines being of great value but unrealistic. Brooks (1997) talked of problems with too much web traffic slowing down the internet and of potential storage devises that hold more than CDroms (ie DVDs). Within six years of Brooks, broadband was available to nearly 80% of the UK population (British Telecom 2004) and DVDs are a standard storage media. This advancement has outstripped all expectations of these writers and the developments are so impacting on the virtual world that much of the earlier research no longer has relevance. With all these freedoms still come constraints. There is still a significant digital divide with more than 51% if households in the UK still without access to home computing and the internet. (BT 2004) This is due to many factors and poor literacy and poverty are listed amongst the greatest factors. 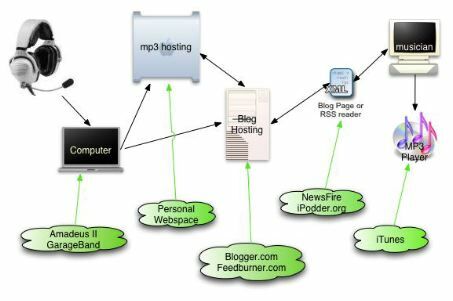 The salient freedom inherent in podcasting appears to be its ability to distribute content via RSS and to utilize non-personal computer technologies such as mp3 players. These opportunities will be discussed in the next section. Podcasting is one of the latest technologies to emerge onto the computing scene and one that has a great deal to offer education. The purpose of this study was to use the action research methodology to investigate the freedoms and constraints of using podcasting to teach instrumental music online. Podcasting is so new that contemporaneous research is few and far between. This research attempts to gain an insight into the freedoms and constraints and ascertain whether it is a viable technology to pursue, or merely a fad. Think how a desktop aggregator works. You subscribe to a set of feeds, and then can easily view the new stuff from all of the feeds together, or each feed separately. Podcasts are generally between 10 minutes and and hour in length, the average being about 20 minutes and have a size of roughly 1Mb per minute of audio. As podcasting is still such a new technology the processes required to create and broadcast podcasts are still fairly complicated as there appear to be no integrated programs or services to date. The following sequence was the process used to create the podcasts for this study2. A feedburner.com account was created. An audio file was recorded using the Apple Mac programmes GarageBand and Amadeus II. The file was saved as an mp3 and compressed a small amount. The feed was burned using feedburner.com to create an RSS that was podcast enabled. The RSS feed was advertised to find listeners. The purpose of the study was to investigate the freedom and constraints of podcasting to teach instrumental music. To complete this study participants were gathered from around the world. Musicians that could already play were targeted so as to gain insight to the learning of tunes without the added dimension of learning to play the instrument itself. After each podcast was created and uploaded, feedback was requested and actions taken dependant on the participants opinions. A Weblog was used to create a RSS feed mechanism and thus all feedback was given as comments under each entry, thereby completing the action research self reflective spiral (Kemmis and McTaggart, 1992:22 cited in Cohen et al 2000:229). All participants were informed that project was for masters degree research in the entries on the blog. All names have been removed from the data here to protect anonymity. Each podcast entry took the form of an mp3 audio file, a jpeg of the music to be taught and a short paragraph of explaining text. Feedback was received in the form of replies to each podcast and any comments acted upon. Each podcast audio file contained verbal explanations of the what was to follow in the podcast, and various versions of a tune to be learnt. The teaching methods used in the podcast altered during the course of the eight podcasts to reflect the feedback from participants. Fig. 3 is a table of the eight podcasts, the content of the audio files and text materials provided and a summary of the feedback received. Buffering stopped, maybe nice to have a version broken up into smaller files. Good to put onto media player and take away. Chunks too small for easy tune. Maybe video would add to experience. All the podcasts and accompanying materials can be found on the blogger website ad extra resources on the podcast vault. The first podcast contained a performance version of the tune from a CD followed by the tune played slowly. The manuscript for this tune was included. The feedback for this tune indicated that it was too fast for the participants to learn and that a version to play along with would be beneficial. A flute tune was used to attempt to widen the audience from just pipers to other instruments. Although some colleagues attempted the tune, all other participants were pipers. As a result of the first podcast feedback a simpler pipe tune was selected. The audio format was set as a pipe duet with a backing created with a program called GarageBand. This program consists of ready made loops and the ability to record more than one live track. Using this programme a duet was recorded with backing track. This was split into the full version and a version without the tune to let people play along. The feedback using this method was on the whole very positive, only one comment that the tune was too easy and didnt require splitting up into such small chunks. Further suggestions were made regarding the file size. One participant mentioned that their media player kept stalling and that the podcast broken up into smaller chunks might be useful. As a result of this request a website page was built and the podcast split into its component parts and uploaded. This was called the podcast vault to represent that this was a storage area for resources. The tune was performed in the key of A and one participant suggested (via e-mail) that it would be nice to include the tunes in the key of D for those pipers who only had pipes in that key. The third podcast took the same form as the second: a pipe duet track with GarageBand accompaniment followed by a breakdown of the tune into small sections finishing with the accompaniment being played for the participant to play along with. Feedback to this podcast showed that the RSS feed was working nicely. Two versions of the tune were recorded, one in D and one in A so that more pipers were able to play along with the music. This was however quite time consuming to produce. The fourth podcast was a flute trio. Although participants seemed to enjoy the tune it was discovered pipe tunes were preferred. The accompaniment was in the form of two extra flute parts and a drum rhythm. It was expressed in the feedback that the drum track was not a good idea. Following the feedback from the previous podcast there was a return to pipe tunes. The accompaniment was made to be an ensemble arrangement: pipe duet, flute and double bass, no loops were used at all. The feedback received on this was the most positive yet. As in the previous podcasts the format was kept to full version, broken down and accompaniment only. Instead of recording a version in A and another version in D a program was used to transpose the pitch and both versions put online. The only drawback to this was that any words spoken at the same time as playing was transposed into a helium enriched sounding voice. The feedback showed that this was acceptable. Podcast number six had no significant changes and feedback was all positive. The RSS and podcast software was functioning for the participants that chose to use it. The podcasts were found to be better as there was more flexibility to be away from the computer and learn tunes. The friendly unrehearsed style of the of podcast speech was very much like having a live tutor, adding video to this would help even more. As with the last podcast there were no significant changes made. The feedback took the form of discussion of extra notes available on bagpipe chanters. Also the benefits of RSS and podcasting over streaming the same content over an internet radio station. The participant felt that podcasting had advantages over internet streaming in that the quality was better and that the file can be taken away on a media player. As podcasting is so new it was difficult to set up the first time, many different processes were required, on the mac it required two different programmes to create the podcast audio file. Personal server space was required and then two different online web-based services accessed. If the podcasts were to remain online for any length of time a lot of storage space is required. This can either be expensive for the a podcaster or mean that podcasts need to be removed on a regular basis and participants need to download promptly. It was also confusing to explain the listening process for new participants. Podcasting involves understanding RSS, the downloading of audio files and accompanying text and using podcast software. Depending upon the podcast software it is possible that a website also needs to be accessed. Some participants were resistant to downloading new software. Further confusion was created as the software is not required to listen to the podcasts as it was possible to download the audio file direct from the website. To access a podcasting it is necessary to have broadband. The files being on average of 15 - 20 Mb preclude those people with only 56k access. e.g. a 20Mb file will take on average 1 minute minute to download on broadband but somewhere in the region of five hours on 56k. Although a participant suggested that podcast be broken up into smaller parts and placed as an archive it was found to be very time consuming to create and created a site that was prohibitively large without having a personal server. The greatest freedom in using podcasting is the ability to download an audio file and place it on a media player and use the file away from the computer. If all the correct software is downloaded and installed the podcasts and accompanying files can be accessed instantly without having to use any extra programmes. The RSS feed automatically checks for updates and downloads files straight to computer. Using podcast software that displays the accompanying blog text there is no need to use a browser. Accompanying files can be linked into the blog entry to help cater for different learning styles. For music teaching this is especially important as most musicians prefer to have both audio and accompanying manuscript. As the audio file can be downloaded it can then be transferred to a mobile media player and used away from computer. Any accompanying manuscript and text can be printed thus taking away the dependency on computer the computer for the learning process. The computer is used as a method for information and learning distribution. This technology is asynchronous, it can be accessed and used whenever the participant wishes. In the global world of the internet this gives the freedom for musicians around the world to learn despite the difference in time zone. The feedback mechanism is a inbuilt on a weblog. Comments can be left on the blog for other participants to read and if so wish collaborate and is not a bolt on feature, but a part of the blogging culture. Podcasting is still in its infancy and as such new software is still constantly under development. There are still bugs and user issues on many of the podcast software RSS feed readers. Some programmes show all the text in the blog entry whilst others do not. Some play audio files without downloading and some do not. This currently causes some confusion amongst people trying to decide which piece of software to use. Once podcasting programmers can create software that integrates all the different processes and podcast-dedicated-blogs are available the process will be made far simpler. There is a lot of scope for teaching music using podcasting, but there is a lot of research that still needs to be conducted in this area. There may be possibilities to incorporate this audio style of learning and delivery into many other aspects of education. This is an area for further research. The focus of this study was to explore the freedoms and constraints of using podcasting to teach instrumental music online. Although there were many freedoms and many constraints, it was recognised that most of the constraints were surrounding the technology and most of the freedoms were surrounding the music teaching. It appeared that podcasting was a good medium for teaching music, but that the technology is not yet suitably developed to facilitate the process. Using podcasting to teach music is an area that needs more development but this study has shown sufficient promise to warrant more research. Swanwick, K. (1979). A Basis for Music Education. Windsor (UK): NFER Swanwick, K. (1996) See Spruce G.
Williams, N. (1998) See Monteith, M.
1 Enclosure Tag - a tag that enables audio attachments to be added to weblog entries and played in podcast software. 2 Note that his is not the only way of creating and broadcasting podcasts.